Cultivating a life led by God's word is one of our 4 core values. Among many events and seminars we want to provide you with the below resources for ongoing cultivation. "And it is my prayer that your love may abound more and more, with knowledge and all discernment, so that you may approve what is excellent, and so be pure and blameless for the day of Christ, filled with the fruit of righteousness that comes through Jesus Christ, to the glory and praise of God." 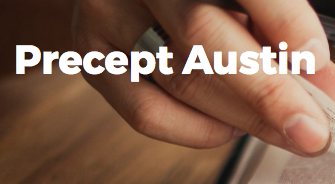 Precept Austin is a fantastic hub for educational resources to dive deep into God's word with depth and clarity. The devotionals section is a great place to start! The Bible Project is a non-profit animation studio that produces short-form, fully animated videos to make the biblical story accessible to everyone. This free course is designed to root your thinking in the framework of truth found in the bible. Providing tools and training to communicate clearly the central message of the Bible. Especially helpful if you'd like to better communicate with people form specific world views and understandings.